It’s been a while since I wrote an actual review on a beer, so this time we are tasting the new beer from O’Hara’s Brewery. It is the second in their Single Hop IPA series Hop Adventure, featuring the legendary Australian hop Galaxy. Those that know O’Hara’s will know that they have a very solid range, yet it is great to see them experiment a little and have some fun. Now to those asking, Single Hop is only using one hop, for Bitterness, Flavour and Aroma. Traditionally beer would be made with a blend of specially selected hops to be used at different stages of the brew. I’m usually a little wary of these beers as they can be a little out of balance. However some hops do lend themselves well to single hopping. Galaxy is renowned for its citrus profile, with hints of Peach and Passion fruit. To allow the hops to shine, the brewers at O’Hara’s have reduced the use of speciality malts that would usually be present. So to the beer, it pours an appealing golden, slightly amber colour with a white head that recedes. The biscuity and malt aroma is present but is restrained, with the fruit notes shining through. How does it taste? Once you take a mouthful you can expect citrus flavours, with pleasant carbonation. There is a bitterness there – not over powering by any means, which makes you want to take another mouthful. So what should you eat with this beer? This would work quite well with white meat like chicken that’s been spiced up slightly, say a Thai Green Curry – the bitterness would compliment the curry and cut through the creaminess. Chicken Fajitas too. It can also work well with subtly flavoured food, such as shrimp, salmon. Where can I get it? You can expect to get this in all good off licences for approximately €3.25 for a 500ml bottle. It will also be available in selected bars. From IPAs to Stouts and everything in between. Wayne is a passionate advocate for Craft Beer and Cider in Ireland. 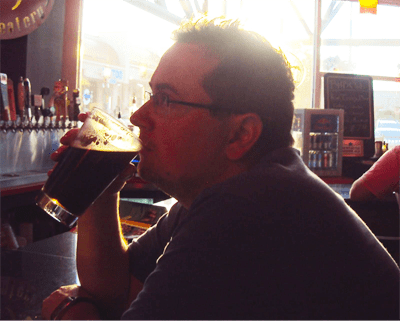 He regularly features in online publications and podcasts, as well as writing with his wife on www.irishbeersnob.com. Wayne’s aim is to kick down the doors of convention surrounding Craft Beer and Cider by writing in a no nonsense style. Drawing on his experiences of many different beers he is going to bring you on a journey that you’ll be asking yourself, why didn’t I join this revolution sooner?